Running and runners have been on my mind for the past few weeks. I started running again. 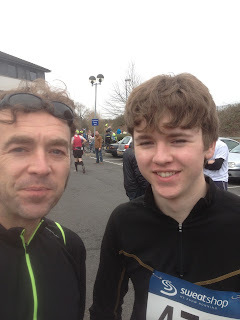 My boy was training for a half marathon, and I ran it with him. He's 16. I had a moment of pride a few weeks before that when he did a fitness test in order to get into an elite rowing programme. He did the collapse test and ran into the toilet to throw up. I felt proud. And I thought: I need to pull myself together. So we ran the Cambridge Boundary Run, and I discovered it was no effort at all. And it was a lovely day. So I've been running, in snow, rain and sun. With and without dog. Slowly and very slowly. And then of course came Monday, and the news of the Boston Marathon. Many things went quickly through my mind – many of them about the way that news works today – but the one my mind kept returning to was: why a marathon? Of all of the events to attack in the name of God or a political ideology or whatever, why a marathon? There is nothing less divisive, less nationalist, less imperialist than marathons. The same might be true for running in general, but marathon runners seem to me to be a truly open community, and a community-minded community, one that rejects national interests, one that embraces the globe. One that recognises that you share something with everyone else who's been through miles 16-18, and especially the things that bring you to confront miles 16-18. I could tell a thousand stories, but I would be digging into memories of when I was a runner. So this morning I set off from Lower Clapton on my fixie at 6:30 am and cycled to Greenwich. I took the towpath along the River Lee Navigation canal, turned onto the Herford Union Canal and crossed Victoria Park before heading down to the Isle of Dogs. I crossed by the Greenwich Foot Tunnel, which was completely deserted. An echoing, sallow artery. Outside the air was cold but bright with sun, the air that wakes your spirit. I ground the single gear north into Greenwich Park, and found the marathon route, near the start. Then I rode the marathon route.When I run I manage to miss everything, as though I have tunnel vision; and with my new-found knowledge of London topography and putting the pieces and perspectives together this was completely different. And it was fun slowly riding the cleared streets (only one jobsworth of a copper – one in 20-odd miles – told me to get off the road), and taking roads on the wrong side, recklessly following the triple blue lines, and riding the wrong way down one-way streets. And reliving those meteoric, aphasic flashbacks of joy and suffering from the four previous times I followed this route (or was it five: there might have been a fifth too painful to recall). All of that was just beautiful. But what was most wonderous was the logistical preparation. Thousands of volunteers. The hundred of helpers erect barriers; hundreds of schoolchildren setting up the drink tables; lorries delivering showers; bands doing soundchecks; pubs putting out tables; the marshalls standing in groups agreeing on roles; marshalls setting up the arches; technicians laying the chip readers under mats at the 5k points; hundreds of charity volunteers setting up banners to cheer the runners ruining their knees raising thousands of pounds for them; well-wrapped sexagenarians carrying their camping chairs to watch from the roadside; hard against the barriers; families with their personal banners. The race was less than an hour away and towards the end helpers were still getting things in place. And everyone – except said copper – was smiley. And I saw a couple of references to Boston, one reading "running London, thinking of Boston", and I thought: you terrorists are trying to deter the wrong people.